When we calculate a simple average of a given set of values, the assumption is that all the values carry an equal weight or importance. 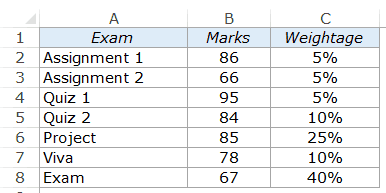 For example, if you appear for exams and all the exams carry a similar weight, then the average of your total marks would also be the weighted average of your scores. However, in real life, this is hardly the case. Some tasks are always more important than the others. Some exams are more important than the others. And that’s where Weighted Average comes into the picture. Now let’s see how to calculate the Weighted Average in Excel. In the above data, a student gets marks in different evaluations, but in the end, needs to be given a final score or grade. A simple average can not be calculated here as the importance of different evaluations vary. For example, a quiz, with a weight of 10% carries twice the weight as compared with an assignment, but one-fourth the weight as compared with the Exam. 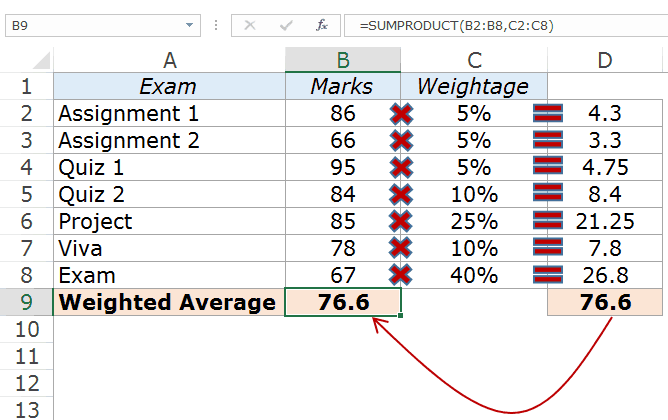 In such a case, you can use the SUMPRODUCT function to get the weighted average of the score. 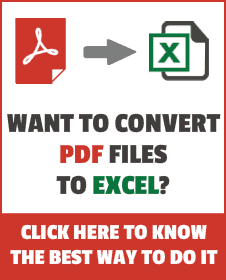 Here is how this formula works: Excel SUMPRODUCT function multiplies the first element of the first array with the first element of the second array. Then it multiplies the second element of the first array with the second element of the second array. And so on..
And finally, it adds all these values. Here is an illustration to make it clear. In the above case, the weights were assigned in such a way that the total added up to 100%. But in real life scenarios, it may not always be the case. Let’s have a look at the same example with different weights. In the above case, the weights add up to 200%. If I use the same SUMPRODUCT formula, it will give me the wrong result. In the above result, I have doubled all the weights, and it returns the weighted average value as 153.2. Now we know a student can’t get more than 100 out of 100, no matter how brilliant he/she is. The reason for this is that the weights don’t add up to 100%. In the above formula, the SUMPRODUCT result is divided by the sum of all the weights. Hence, no matter what, the weights would always add up to 100%. One practical example of different weights is when businesses calculate the weighted average cost of capital. For example, if a company has raised capital using debt, equity, and preferred stock, then these will be serviced at a different cost. The company’s accounting team then calculates the weighted average cost of capital that represents the cost of capital for the entire company. In the example covered so far, the weights were specified. However, there may be cases, where the weights are not directly available, and you need to calculate the weights first and then calculate the weighted average. Dividing the SUMPRODUCT result with the SUM of quantities makes sure that the weights (in this case quantities) add up to 100%. While SUMPRODUCT function is the best way to calculate the weighted average in Excel, you can also use the SUM function. To calculate the weighted average using the SUM function, you need to multiply each element, with its assigned importance in percentage. This method is alright to use when you have a couple of items. But when you have many items and weights, this method could be cumbersome and error-prone. There is shorter and better way of doing this using the SUM function. The trick while using this formula is to use Control + Shift + Enter, instead of just using Enter. Since SUM function can not handle arrays, you need to use Control + Shift + Enter. When you hit Control + Shift + Enter, you would see curly brackets appear automatically at the beginning and the end of the formula (see the formula bar in the above image). Calculating Loan Payment Using PMT Function. Excellent explanation Sumit! I like the modification to the formula when the %s add up to more than 100. I’m going to share this!